Energizer Lithium Batteries Giveaway Closed!! I know that with kids and a husband who has many gadgets, we use and go through quite a bit of batteries in our house. So when I go and pick up some batteries, I know that when I get the Energizer Lithium Batteries, I know that I am being a good savvy shopper. Because the Energizer Lithium Batteries last up to 8 times longer than other batteries so I am not only saving money on buying batteries every time I turn around, but I am also saving on trips to the store to buy batteries!!!! Ultimate Lithium or Energizer® Advanced Lithium batteries and you will get a $10 Prepaid Discover® Gas Rewards* card mailed to you. It’s that easy. Energizer® Advanced Lithium batteries last up to 4x longer** in digital cameras, 20 hours longer** in wireless gaming accessories and up to 30% longer** in personal audio devices. (Vs. Energizer® MAX®. Results vary by device and play and/ or usage patterns.) 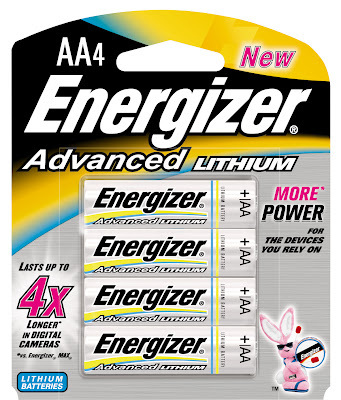 The wonderful people from Energizer sent me a pack of the Energizer Advanced Lithium AA Batteries and a pack of the Energizer Ultimate Lithium AA Batteries to review, they are also going to give one of my awesome readers the same with the choice of either AA or AAA. Tell me what devices you use or someone in your family uses, that requires you to change the batteries often!! Please leave me your email with this entry!! This giveaway is open to US residents. This giveaway will end at 11:59 pm on July 18,2011. Winner will be chosen at random.org and will be given 48 hours before another winner will be chosen. All products for reviews and giveaways are given as a sample from the companies. All opinions in reviews I conduct are my own. I was not paid to say anything or review any products. We have a Wii, and the remotes always use up batteries. My sons toys are always needing new batteries! Always having to change the batteries in our flashlights! I liked Energizer on FB! I entered your giveaway for XBOX 360 Console w/ Kinect.